Well don’t I feel foolish. LinkedIn has done it to me again; it has changed its functionality and removed a feature I thought was so outstanding that I wrote a post on it. The feature to which I refer was called Lost Touch. Lost touch allowed you to traverse immediately to the connections with whom you communicated long ago. So if I hadn’t sent messages to people four years ago, I would know exactly who they are and can renew our relationships. I could see the removal of this feature as a kick in the gut, or I could take it as an opportunity to reach out to all of you by writing another post on what one has to do in order to contact connections who they haven’t seen in oh…two years or more. So I’m opting for the latter. But there is bad news and good news; I’m going to give you the bad news followed by the good. The bad news is that it’s not as easy to access your long forgotten connections. Don’t follow the instructions I provided in my last post on this subject, which was written a whopping four days ago. Can you imagine something becoming obsolete in just four days? To get to your connections with whom you spoke eons ago, simply click on Network and select Contacts. You will see a screen that looks similar to mine. Select the drop-menu Sort by Recent Conversation. Next select New (circled in the diagram). This is where the maddening work begins. Scroll down the screen to the point where you want to make contact with your connections. For some of you Super Connectors, this process might take days. I wish there were an easier way to do this, but I’ve searched near and far for my beloved “Last Touch” with no success. Once you’ve selected the connections with whom you’d like to reconnect, select (you got it) the envelop that appears at the top of your connections list beside the word Message. You are on your way to sending a mass message to your long forgotten connections. My message, by the way reads: Wow. 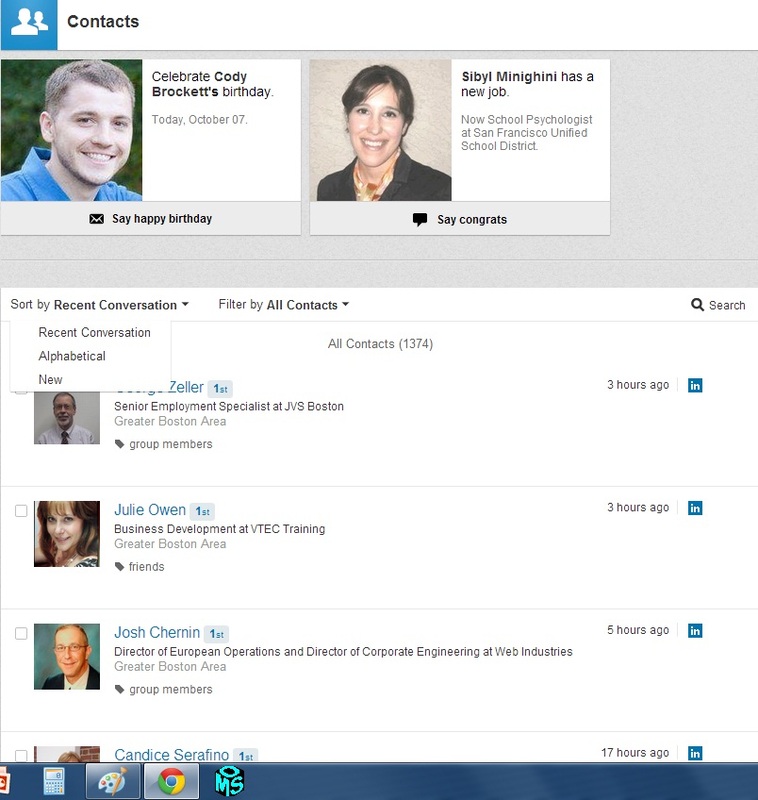 According to LinkedIn, we haven’t communicated in at least two years. What’s been happening in your live? I’d love to re-connect. The good news. Many of my long forgotten connections have written back and thank me for re-connecting. They’ve let me know how things are going for them. Some who read my previous article were confused by my instructions, desperately wanting to know how to access Lost Touch. Now I need to deliver the ultimate bad news; it no longer exists. This entry was posted in Career Search, LinkedIn and tagged LinkedIn, Lost Touch, Obsolete Feature on October 8, 2013 by Things Career Related.